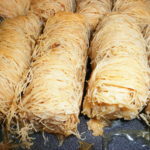 Paklava: the ultimate Middle Eastern edible sin [discuss]. Its syrupy flooziness has been seducing the weak-willed for centuries. It is common to practically all of the lands which comprise Veggiestan, although in all likelihood it was first prepared by those jolly creative Ottomans. 1) Diamond paklava – this is the one that everyone knows, and remains the most popular choice. In Greece and Turkey they tend to be cut much larger. They can be filled with any nuts: we like them best when the baker uses walnuts. 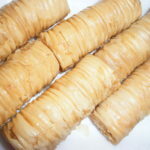 2) Assabee – filo finger pastries filled traditionally with almonds, although ours are often stuffed with cashews. 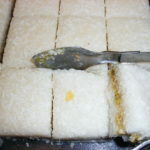 3) Kulwuskur – these are the most buttery of the lot. Soft half moons of flaky pastry wrapped around syrupy cashews. 4) Boukage – shaped like a flower, or an open parcel. Filled with cashews or almonds. 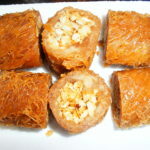 5) Bourma – nests of sticky shredded pastry filled with pistachios or almonds. 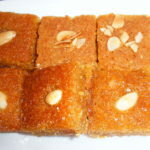 6) Namoura – fragrant coconutty almondy syrupy semolina cake. Soooo good. Also uses the aliases ‘basposa’ and ‘shamali’. 7) Coconut and pistachio – well, yes, it’s just that really. Think old-fashioned coconut ice, with pistachios in the middle. 8) Kataif – the Dougal of the cake world. 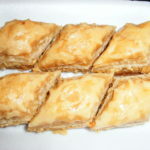 More shredded pastry with nuts up it. 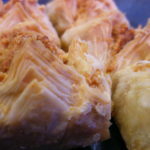 9) Ma’amoul – which isn’t paklava at all, but is equally wonderful. Soft buttery shortbread filled with dates/nuts. 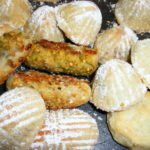 The oval ones contain pistachio and the round sugar-dusted ones walnut, whilst the plain round ones and the nutty fingers contain dates. Make sure you swat up on this, as we reserve the right to test you on it next time you are in the shop. See you soon for your next fix….